I am having trouble searching. Why can't I find a business on the MINDBODY app? Having trouble finding your favorite business listed on the app? Enable the location services on your phone to show nearby businesses. The MINDBODY app uses the location services on your phone to find nearby businesses. If you're not seeing any nearby businesses, it's likely the location services on your phone have been disabled. When this occurs, the app will prompt you to enable these settings. Click here to learn how to expand your search radius, or search by location. Still can't find a business? 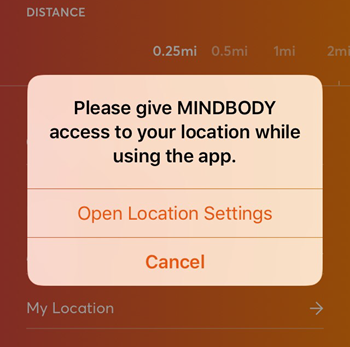 If you can’t find a business in the app and you know they use MINDBODY®, that means they’ve opted out of using the MINDBODY app. They may have done so with good reason (e.g., they offer an app of their own), but it could also be that they’ve never heard of the MINDBODY app. Let the business know that you’re interested in booking from your phone to see what solutions they can offer.